It took us a very very long time to select DOP San Marzano Tomatoes to import to America and carry in Gustiamo’s Italy’s Best Foods’ catalog. It looks like in America everybody grows and sells San Marzano! With all the fakes around, we needed to be absolutely sure to find a producer with our same passion, integrity and honesty. Gustiamo is proud to import San Marzano Tomatoes from Danicoop, a cooperative of 100 farmers in the Agro Sarnese Nocerino, a small area south of Napoli, where the village of San Marzano is located. 2. We met the farmers, visited the fields, saw the plants and know Edoardo Ruggiero’s family well and can vouch for them. From left: Pasquale (son), Anna Maria (Mrs. Ruggiero), Paolo (son), Edoardo and Lucia (Paolo’s wife). This picture was taken in the shop of Danicoop, where they sell food from local artisans (including Maida‘s) and produce grown by the farmers members of the cooperative. Below is Paolo, Edoardo’s son, explaining to us what the “spaccio aziendale” is all about. 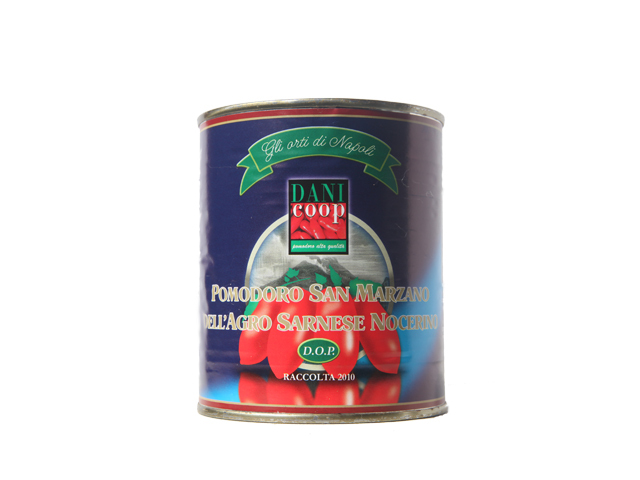 If you go to the Sarnese Nocerino area, you must do your food shopping at Danicoop. As we say in Italian, Kilometro Zero doesn’t get shorter than this! Click on the arrow to see and listen to Paolo Ruggiero. In English. Bravissimo!!! Next Post San Marzano Tomatoes??? San Marzano or Giuseppino??? I am so happy that I finally found the real thing. You are right, there are many many labels promissing “San Marzano” on the package, but so far I used to get dissapointe when I would try that. But now I have found a real difference in these cans! I have made the ultimate test, by cooking the same sauce side by side, exactly the same way, and both claimed to be San Marzano whole tomatoes. I have done this before, and usually only found a difference in texture, but not in taste. Now this time it was different! The Dani Coop tomatoes were indeed different and better!!!! Thank you so much for making these available for us!! Do you have any in glass jars rather than tin cans? No, they only come in tins. At the moment we only have tins of 500gr. The new harvest will start shortly and starting next September, we’ll have also the 1 Kg tin. Tracy, thank you so much! What a lovely comnent! It deserves a full new post. I’ll write it shortly. Grazie. Pingback: Tomatoes Made in Italy - Who Are We Kidding? Is there a website address to order from? I’m desperately trying to get my hands on some but I’m finding it extremely difficult with searches to find a website I can trust. Thank you in advance!